Despite what the stats showed, the Seahawks' rookie linebacker said he felt it took a little while to really get going Thursday against the Colts. That Shaquem Griffin was credited with either an assisted or solo tackle on four of his first seven plays in his first NFL exhibition game Thursday — in fact, all four came on consecutive plays — might make the comment offered about his performance Sunday by Seahawks coach Pete Carroll seem a little perplexing. Griffin agreed that despite the lofty stats — and it’s fair to note a few of his assists came on plays in which other players had the primary stop — he needed a little time to really find his footing. “I just (saw) a lot of things I could work on,’’ he said of what the film showed. Griffin agreed that his reads of what the offense might have coming his way — and hence, his ability to make significant plays — improved as the game wore on. Asked his favorite play of a game in which he was officially credited with a game-high nine tackles, he cited a tackle-for-loss of former Seahawk Christine Michael in the third quarter. To Griffin, the play was proof that he is learning some of the intricacies of playing weakside linebacker, where he is in the middle of the defense and behind the line compared to in college where he was primarily on the outside and often at the line. In fact, the need to prepare may be what Griffin said he learned from the game more than anything. None of which is to discount what Griffin did Thursday night in accomplishing two rather amazing goals — playing again with his twin brother Shaquill and showing he could get to the NFL despite a birth defect that left him with just one hand. But in some ways, Griffin’s greatest triumph is also to get the point where he is treated like just any other NFL player. That’s exactly what Carroll has been doing, making it clear several times recently that for all the attention lavished on Griffin and the emotion engendered in his drafting by the Seahawks, it was now time for him to just become a football player. Once Griffin got comfortable Thursday, Carroll said the Seahawks saw the things that where why they wanted to draft him in the first place. Carroll twice also mentioned what Griffin showed on special teams — he didn’t have any tackles but was involved in a number of them and in the middle of the action a few times — which may have been a little foreshadowing. “Had a heck of a game for a first time out on special teams, as well,’’ Carroll said. Griffin’s move to weakside linebacker seemed to be made with the future in mind. He’s playing behind veteran K.J. Wright, who has just one year remaining on his contract and no evidence an extension is coming anytime soon. The Seahawks appear willing to see how Griffin adjusts to the weakside linebacker spot and if he can move seamlessly into it a year from now before figuring out what to do with Wright. As for this year, Carroll’s comments about Griffin’s special-teams play likely speak to what the team sees as a more realistic role for him this season. Griffin vows to show with each exhibition game that he is ready for whatever the team wants to throw at him. A play Griffin considered one of his bigger learning experiences came on that same first drive, when he was pushed back by Colts tight end Jack Doyle, who caught a pass for 9 yards to pick up a second-and-eight. 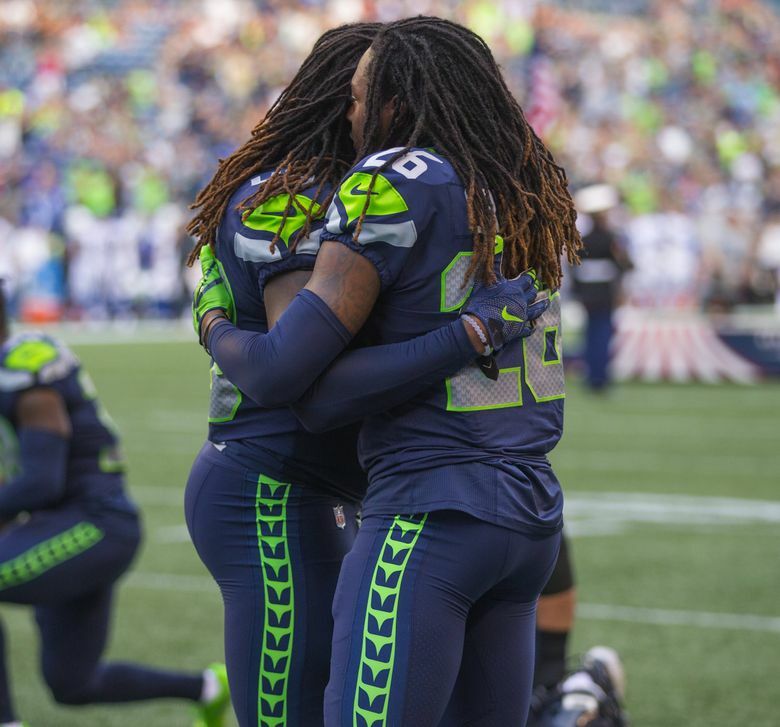 Shaquill Griffin talks about what it was like playing with his twin, Shaquem, on Thursday.